(New!) Entry fees remain RM100.00! (New!) Increased & Extended Prize Money for Mix Team: 2nd-RM800 / 3rd-RM600 / 4th-RM400 / 5th-RM200. (New!) 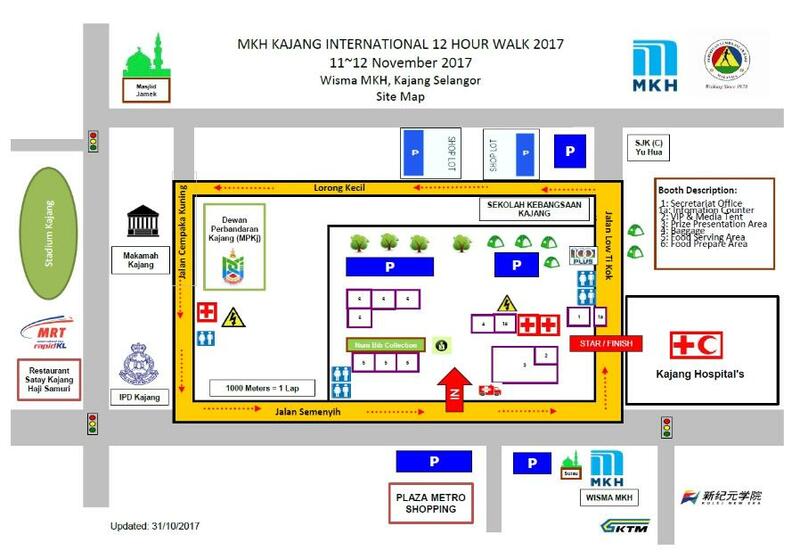 Extra Prize for 1 (one) best Malaysian performer in MKH Kajang International 12 Hour Walk (Man or Woman) will be sponsored to take part in the coming Hong Kong 50km walking 2018 event. The prize includes return air-tickets (economy class) & accommodation (2D1N). Paper/By Hand submission will be imposed additional RM5.00 for processing fees. Discount RM10.00 for RWAM Member will be reimbursed on 12/11/17, Sat(2pm-7pm). The race will closed once reached 500 Walkers or 1 November 2017. This is a WALK event, you MUST NOT run or jog! Participant may rest, eat, and use the washroom during the event. Camping is allowed, please prepare own camping equipment. Self prepared food is allowed. Participant is not allowed to walk out from the competition ground. Any accident 'WILL NOT' be responsible by the organizer. Achievement Medal will be awarded starting at 5:00am onwards on 12 Nov 2017. Walkers' Number Bib, Backpack, ULTRON T-Shirt & Other Sponsors' goodies. Four (4) Refreshments / Meals (Halal: Healthy Food) provided during the 12 Hours (11pm, 2am, 5am & 8am). Ever ready medical team (12 Hours) to assist Foot & Leg Treatment. Unlimited Isotonic / Coffee & Tea / Drinking Water for the 12 Hours.